You can order Adobe InDesign CS4 Styles from Peachpit.com and from Amazon.com. Regardless of where you buy it, you can register your copy of the book on the Peachpit web site and download two bonus chapters. I wrote way too much to fit in its 256 pages, but the material that got pulled from print will still see the light of day as downloadable content. You can read the glowing reviews on Amazon.com or read a comprehensive review at Applelinks. InDesign CS4 Styles was also issued as a French language edition (Les Styles Sous Adobe InDesign CS4) and won an Award of Excellence (Trade Professional) at the 39th annual Booksbuilders West Book Show in 2010. Below is the table of contents for the print version. 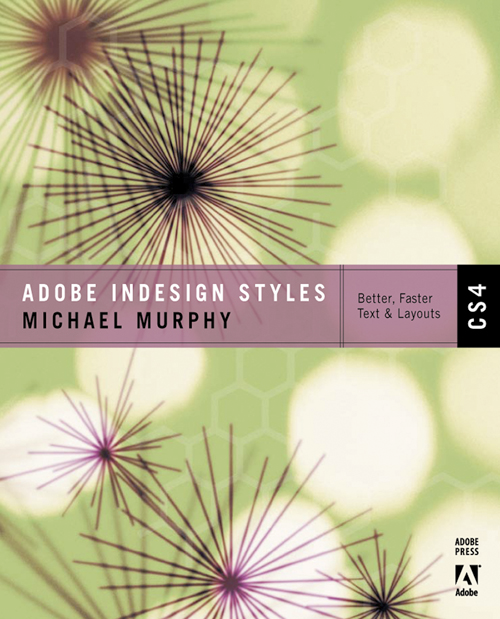 Adobe InDesign CS4 Styles is also available as an ePub.